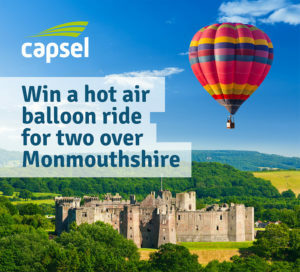 Win a hot air balloon ride for two over Monmouthshire in our free to enter competition! Do all three to triple your chances of winning! This promotion is in no way sponsored, endorsed or administered by, or associated with Facebook. You understand that you are providing your information to Capsel and not to Facebook. This competition is in no way sponsored, endorsed or administered by, or associated with, Twitter. You are providing your information to Capsel and not to Twitter. By participating in this competition you will fully release Twitter and Facebook from any and all liability, claims, demands, and causes of action for personal injury and or damage, theft, or loss suffered in connection with this competition or the use or acceptance of the prize or any portion thereof whatsoever. The term provider refers to Virgin Balloon Flights. a UK resident; and 18 years old or over at the time of entry. This competition is being run by Capsel, which is the trading subsidiary of Monmouthshire Housing Association. Competitions are not open to staff of Capsel. Entrants must either; like the Facebook post, provide Capsel with a valid email address on the Capsel website or retweet the relevant post on Twitter to be eligible to win. Each entry will be classed as a separate entry and one person can have up to three entries in the draw. Entries must be submitted by September 30th and no responsibility can be accepted for entries that are not received for any reason. The winner(s) will be selected by random and will be notified either by Facebook message, Twitter direct message or email after the closing date. Please ensure your privacy settings allow us to message you. If we cannot contact you or you do not respond within two weeks, Capsel reserve the right to offer the prize to another competition entrant. No prize or part of a prize is exchangeable for cash. If an advertised prize is not available, we reserve the right to offer an alternative prize. By entering a competition you are agreeing to Capsel storing and using your information for marketing purposes. We will not share your information with third parties unless you specifically agree to us sharing these details. Capsel reserves the right to amend these rules at any time. If we do this we will publish the amended competition rules on the Capsel website. These are the rules which apply to your participation in our competition. By submitting your entry you agree to these rules. If you do not agree, please do not submit your entry. Winning the competition will entitle you to participate in a hot air balloon flight. Winner(s) will only be entitled to fly on the days and times detailed against the voucher. Capsel assumes no responsibility and is not liable for any costs, charges or expenses incurred by the winner(s) in connection with claiming the prize won in the competition. This includes travel to and from the launch site, which the winner(s) have sole responsibility for. Capsel is not liable for any damage, loss, injury or disappointment suffered by the winner(s) as a result of accepting the prize. The winner(s) may be required to participate in publicity connected with the competition and in entering the competition, entrants agree to their name and image being made publicly available if they win. All booking of flights is at the discretion of the winner and must be done through the flight provider. Capsel has no responsibility for booking the balloon flight or for any cancellations which may occur and must be done through the provider. All enquiries regarding balloon flights should be made to the provider. Your voucher is valid for a period of 12 months from the date of purchase. If your flight is not taken during that period, you will lose your right to take it. The winner(s) will enter into a contract direct with the prize provider and Capsel will retain no liabilities for any injury which occur.